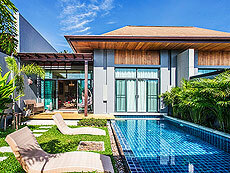 2 bedroom rental villa that set in lush tropical gardens! Villa Mali is a Rental Villa located in Saiyuan where just 5 minutes away from two beautiful beaches Nai Harn beach and Rawai beach. Not only offer stunning views but are complete with great shopping and dining that include local restaurants, fresh seafood, and international cuisine. In addition, bars, minimarts and massage etc. In the room decorated with a variety of vibrant paintings, both modern and traditional with high quality furniture that makes you comfortable.